Helen and I have just come back from a week long tour of the Lake District and Borders of Scotland. We left home on Monday quite late as it was raining very heavily all morning. We left at around 2:00pm, although the heavy rain had subsided it was still very wet on the roads and still raining. 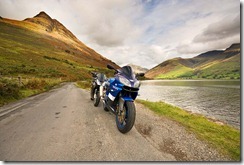 Even though the conditions weren’t great I was still enjoying riding the ZX-9R. We took our usual route to Clitheroe and then headed towards Skipton on the A59. As usual we turned off the A59 at Sawley and then headed towards Settle via Wigglesworth and Rathmell. Surprisingly half way between Sawley and Wigglesworth we came across dry roads and the sun. We soon joined the A65 near to Settle and headed towards Kirkby Lonsdale via Ingleton. We stopped at Devils Bridge for a brief comfort break and then decided while the weather was nice to head North towards Sedbergh on the A683. Just before Sedbergh we took the B6256 to cut across to the A684. We joined the A684 and took this nice and twisty road over the M6 and down into Kendal. We skirted around Kendal and then joined the A591. We soon got off this road and headed West on the A590. We took the A590 all the way to my Mum’s static caravan near Bouth. We quickly unpacked our bike luggage and then headed out to Booths in Ulverston to get some food for the next couple of days. We decided as the weather was so nice to walk into Bouth and have a meal at the White Hart. Walking back in the pitch black dark after a couple of drinks was difficult to say the least. We woke up this morning to bright skies and dry roads. We decided that we would go to Wast Water as it is beautiful unspoilt part of the Lake District. We set out on minor roads and then joined the A5092 at Spark Bridge. We continued on along this road and then joined the A595 at Grizebeck. We followed the A595 as it twisted and turned it way towards Holmrook. We left the A595 just after Holmrook and then headed on minor roads alongside Wast Water to the end of the road at Wasdale Head. We stopped here for a comfort break and a coffee. 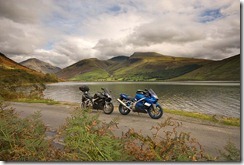 We left Wasdale Head and briefly stopped next to the lake to take some photos of the bikes. We then continued on minor roads to Eskdale Green where we stopped for lunch. We left Eskdale Green and headed over Birker Fell to Ulpha. From Ulpha we headed on minor roads to the A595 at Duddon Bridge. We then turned down the A593 to Coniston, from there we continued on the A593 to Ambleside. From Ambleside we went up the Struggle to the Kirkstone Inn for a coffee. After the coffee we set off back towards the caravan on the A592 and soon arrived in Bowness. From there we took the A592 along the side of Lake Windermere to Newby Bridge. There we joined the A590 towards Ulverston and soon arrived back in the caravan in Bouth. The weather forecast for the Lake District wasn’t good today, but the forecast further East looked better. So we decided to get up early and head East before the rain came. We left the caravan and headed to Kendal on the main roads. We then joined the A6 and headed over Shap to Penrith. 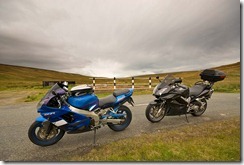 We then joined the A686 to Alston, we where soon at the start of the winding climb up to Hartside Cafe. For a change the road was dry and fairly quiet, so we both were able to have a good run up to the top. We stopped at the cafe at the top for coffee and cake. We left the cafe and headed down off the top towards Alston. We soon reached Alston and then continued on the A686 to Haydon Bridge. From there we took the A69 to Hexham and then turned back to head home. From Hexham we joined the B6305 and then the B6303. We followed this road South and then continued on it as it changed to the B6295. We stopped briefly for lunch in Allendale. After lunch we continued South and soon joined the A689 towards Stanhope, as we reached St John’s Chapel we joined minor roads and went over Langdon Common. We then joined the B6277 near to Langdon Beck and then followed this road into Middleton-in-Teesdale. In Middleton we joined the B6276 and headed over Lune Moor and Stainmore Common to Brough. From Brough we followed the A685 to Kirkby Stephen. We stopped in Kirkby Stephen to fill up with fuel. As we where at the garage it started to rain lightly. We left Kirkby Stephen and continued on the A685 to Tebay. The skies over the Lake District looked grim and within no time we were in heavy rain. 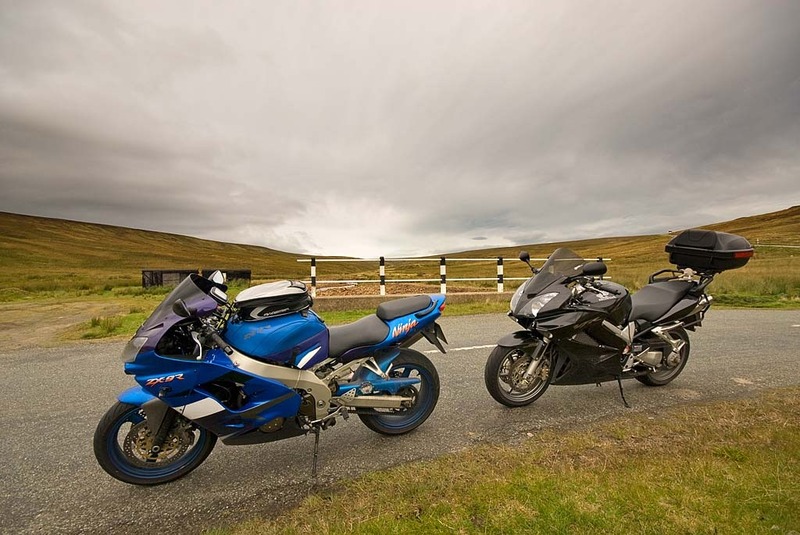 At Tebay we continued on the A685 all the way to Kendal. We then joined the main road and headed back to the caravan in Bouth. It pretty much rained all the way back and it was very heavy at times. Apart from my soggy gloves, the rest of my bike gear was dry. My Bagster tankbag stayed perfectly dry with it’s protective cover. My Goretex Hein Gericke textile suit and Alpine Stars boots also performed brilliantly. We knew from the weather forecast that it was likely to rain all day today. We woke up to very heavy in the morning and just waited it out for a while. After some time the rain stopped and a patch of blue sky appeared. So we packed the bikes and headed out as it just started to rain again. 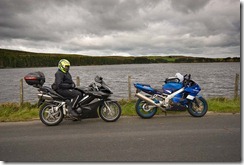 We took the main roads to Kendal again and then joined the A6 and headed over to Shap. The A6 over Shap was very grim and the rain was so heavy at times that you could feel every spot hitting your arms. From there we continued on the A6 to Penrith and then on towards Carlisle. Just before getting to Carlisle we jumped on the M6 at junction 42 and then got off at junction 44. We joined the A7 here and headed into Longtown where we filled up with fuel. We continued on the A7 and then pulled off at Canonbie to have a spot of lunch. We decided to stop here as we knew it was quiet and the rain had actually not been here yet. But just as we were finishing lunch it started to rain again. 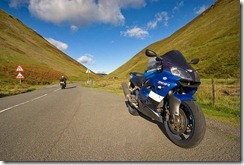 so we quickly got back on our bikes and joined the A7 again towards Hawick. We stopped in a dry Hawick for a comfort break and I dried my hands, as my gloves were very sodden wet now. We left Hawick and joined the A7 again and headed up to Selkirk. At Selkirk we joined the A707 and then the A72 towards Peebles. This road was nice and winding but we couldn’t enjoy it really due to the very wet roads. We eventually arrived at our hotel for the next 2 days in Cardrona. We parked the bikes on the pavement near the entrance to the hotel as they had kindly put in some dropped kerbs for bikers. We soon forgot about all the rain after we had been greeted with our lovely hotel room. Surprisingly all my kit except my gloves had kept me dry all day, despite being subjected to pretty much constant rain all day. We woke this morning to blue skies and a bright yellow thing in the sky. Roads were still a bit damp and we had a light shower as we set out, but within no time it was dry and stayed rest for the rest of the day. We left the hotel and headed on the A72 through Peebles . After Peebles we passed by Neidpath Castle on the left and soon after we turned left onto the B712. We followed this picturesque road through Dreva Forest all the way to the A701 which we joined at Rachan Mill. We then followed the very fast A701 all the way into Moffat, where we stopped for fuel. From Moffat we joined the infamous A708 and headed towards Selkirk. 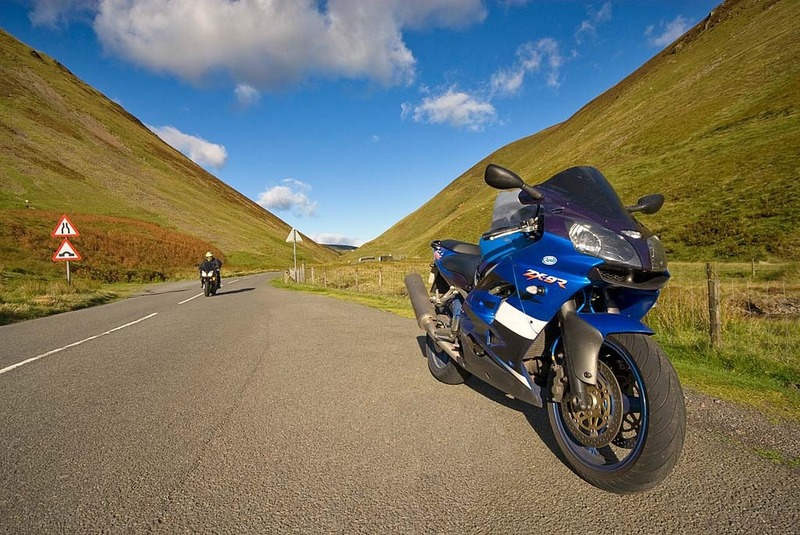 The A708 is a stunning road that twists it way down a valley and alongside Moffat Water. 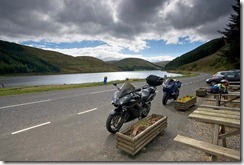 After a fantastic and pulsating ride we stopped at Glen Cafe by St Mary’s Loch. After the short coffee and cake break we headed North again on the A708 towards Selkirk. Near Mountbenger we turned right onto the B709. Then just past Tushielaw we turned left onto the B711 towards Hawick. This again was a nice picturesque road, we came across some recent logging activity we debris and piles of logs by the roadside. 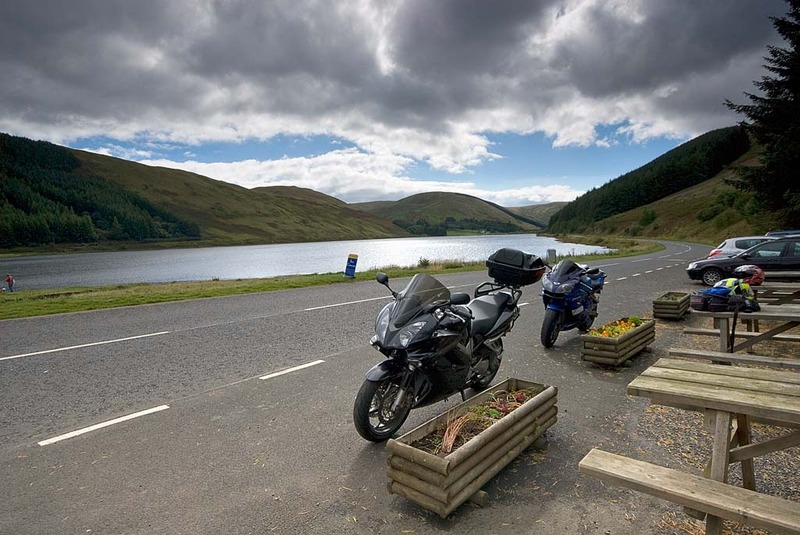 We then passed by Alemoor Reservoir and then continued on the B711 and then the A7 into Hawick. We went to Hawick to visit the Steve Hislop and Jimmie Guthrie rooms at Wilton Lodge Park Museum. After the museum we left Hawick on the A7 and headed to Selkirk. In Selkirk we joined the A708 again and soon stopped at the lovely Waterwheel Tea Rooms near to Philiphaugh for a late lunch. After lunch we rode the A708 all the way back to Moffat again, the roads were completely dry now so we could really enjoy this amazing road. From Moffat we took the A701 back North and then cut back across to Peebles on the B712. We stopped at the Peebles Tesco for a picnic tea and then headed back to the hotel after an amazing days riding. We awoke to blue skies and bright sunshine this morning. The forecast was for good weather all day long. We packed up the bikes and headed out. We joined the A72 and then the A707 as we headed for Selkirk. We filled up on the South side of Selkirk and then turned left onto the A699. We joined the B6453 and then headed through Midlem to join the B6400 towards Jedburgh. 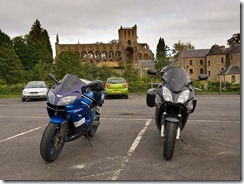 We then joined the A68 North of Jedburgh and headed South into Jedburgh. 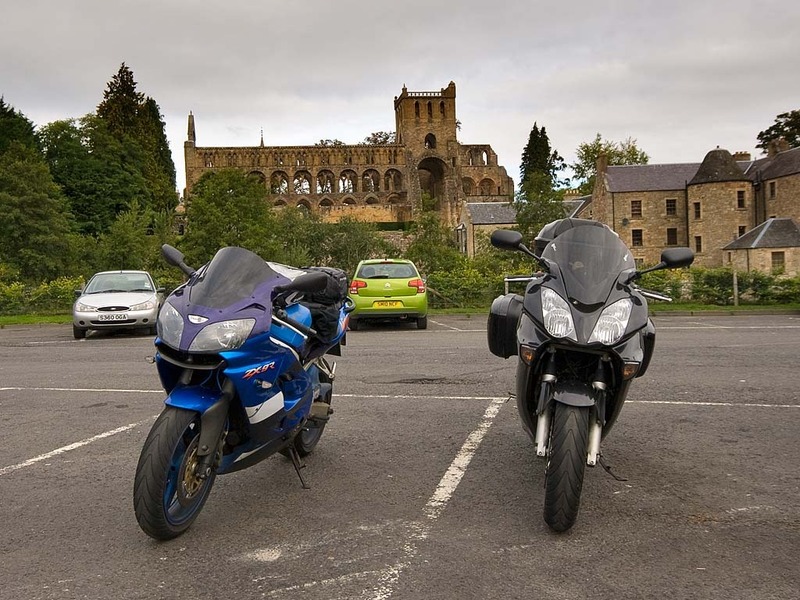 We parked up next to Jedburgh Abbey for a short comfort break. We left Jedburgh on the A68 but soon turned onto the B6357 towards Bonchester Bridge. We had specifically cut across to Jedburgh to join this stunning B road. We continued South on the B6357 and briefly joined the A6088, before rejoining the B6357 again. This section of the B6357 all the way down to where it meets the B6399 is simply stunning to ride. Fantastic corners and scenery with very little traffic, what more could you ask for. One sweeping tight lefthander sticks out especially. The rest of the B6357 is also stunning and we were soon at the end of it and in Canonbie. Here we joined the A7 and headed back into England and through Longtown and joined the M6 at Junction 44 near Carlisle. We got off the M6 at junction 42 and joined the A6 towards Penrith. 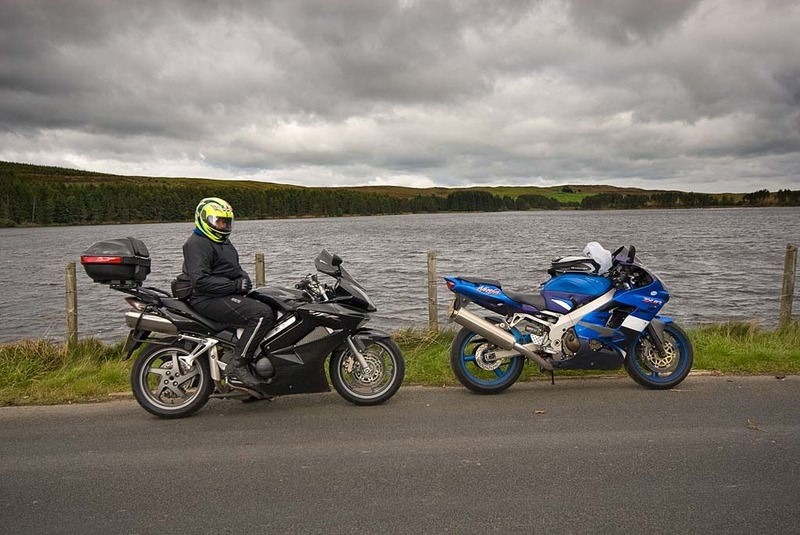 We headed through Penrith and continued on the A6 to Shap, where we stopped for lunch. After lunch we left Shap and then turned left onto the B6261 to Orton. From Orton we took the B6260 to Tebay and then joined the A685 towards Kendal. As the A685 left the side of the M6 we turned left onto the B6257 and headed under the M6 towards Sedbergh. We briefly joined the A684 before rejoining the B6257 and then onto the A683, which we took down to Devil’s Bridge at Kirkby Lonsdale. 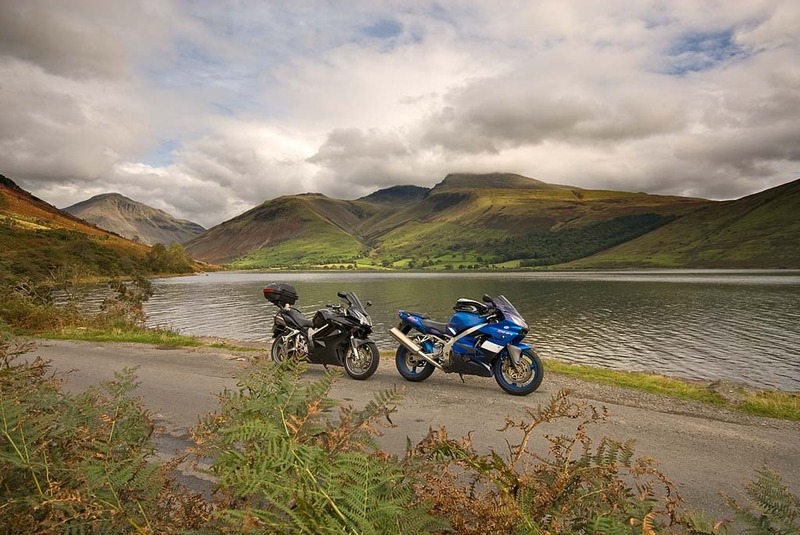 We stopped here for a brief coffee at this famous biker meet point. We left here on the A65 towards Skipton and then stopped briefly in Ingleton for fuel. From Ingleton we continued on the A65 before turning off before Clapham and heading over Burn Moor and past Stocks Reservoir. We then turned right onto the B6478 and headed through Slaidburn and then over Waddington Fell and down into Clitheroe. From Clitheroe we followed the A59, A671 and then the A56/M66 back home.